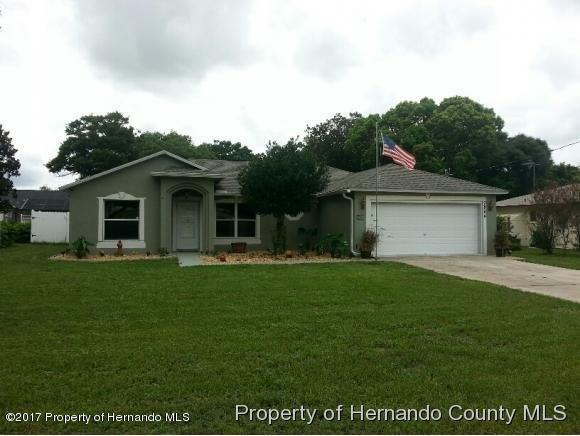 Short Sale - Attractive well-maintained 3/2/2 home with upgrades including kitchen glass tile backsplash, paint & flooring throughout. The Range, Dishwasher and Microwave new 2017. The front exterior features a flag pole, attractive coach lights, flower beds and a front walkway and entry way with a decorative stamped pattern. The backyard features an above ground pool, a privacy fence, a screened porch, an open deck that's partially covered, and a shed. Room dimensions and approximate and not guaranteed accurate. Repaired sinkhole with report & remodeled since. Directions: From Mariner Blvd. take Linden East, turn right on second Lema, house on the right.